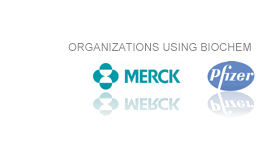 The BioChem library is an extendable, general-purpose Modelica library for modeling, simulation and visualization of biological and biochemical systems. The library is designed to be used together with Wolfram SystemModeler, which enables several extra features such as Systems Biology Markup Language (SBML) import and export. BioChem can, for instance, be used for selecting drug targets with PK/PD modeling or searching for novel drug targets with mechanistic modeling of the reactions in a cell or organism.